"ProDrop Abstract Orbs is a set of cinematic background generators that are sure to add an artistic touch to any video project," said Christina Austin - CEO of Pixel Film Studios. ProDrop Abstract Orbs is an all new abstract-shape background generator for FCPX. 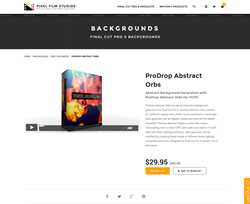 ProDrop Abstract Orbs comes with 7 loop-able presets for the user to begin editing with. Each tool can be adjusted by each individual layer, giving users unique customizability and creativity. ProDrop Abstract Orb Presets consist of 20 second looped animations, but can be stretched as long as the user desires. 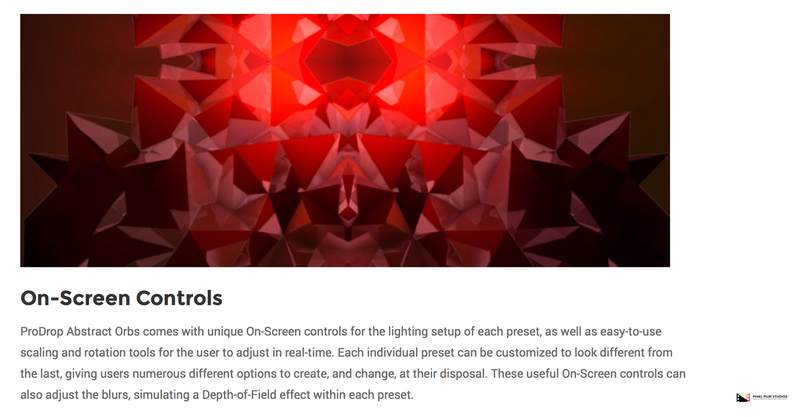 ProDrop Abstract Orbs comes with unique On-Screen controls for the lighting setup of each preset, as well as easy-to-use scaling and rotation tools for the user to adjust in real-time. Each individual preset can be customized to look different from the last, giving users numerous different options to create, and change, at their disposal. These useful On-Screen controls can also adjust the blurs, simulating a Depth-of-Field effect within each preset. ProDrop Abstract Orbs comes with a unique compositing tool which allows users to adjust overlay flares, prism effects, and more after each generator has been completely stylized. This compositing tool is easily placed over the generator as a title, so it can be used in multiple variations. 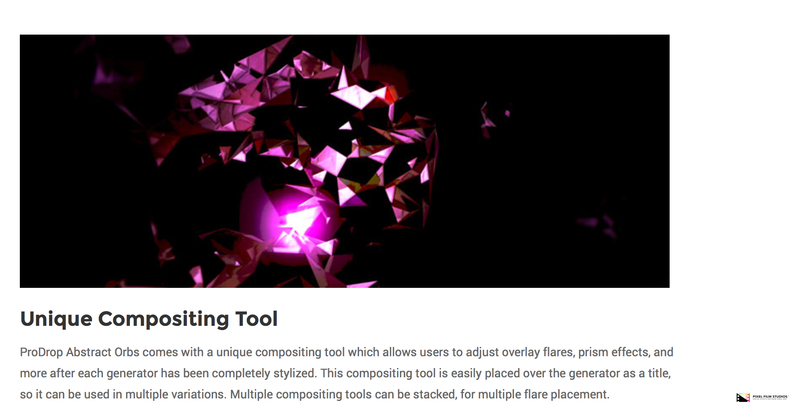 Multiple compositing tools can be stacked, for multiple flare placement. 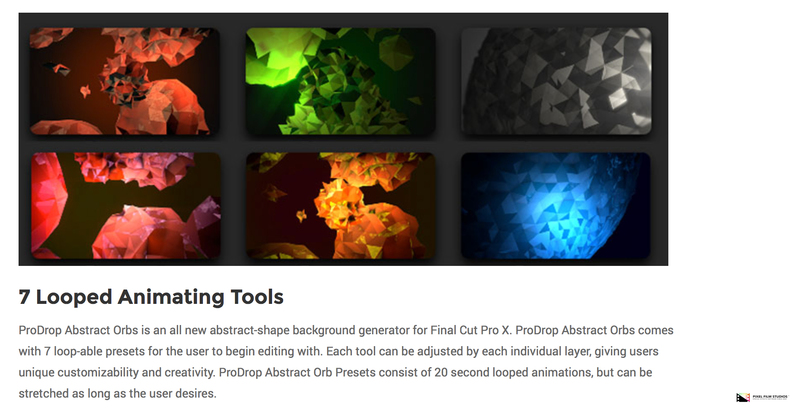 ProDrop Abstract Orbs is a set of titles and generators designed exclusively for Final Cut Pro X. Each generator consists of a different set of layers which can be modified to the users liking. 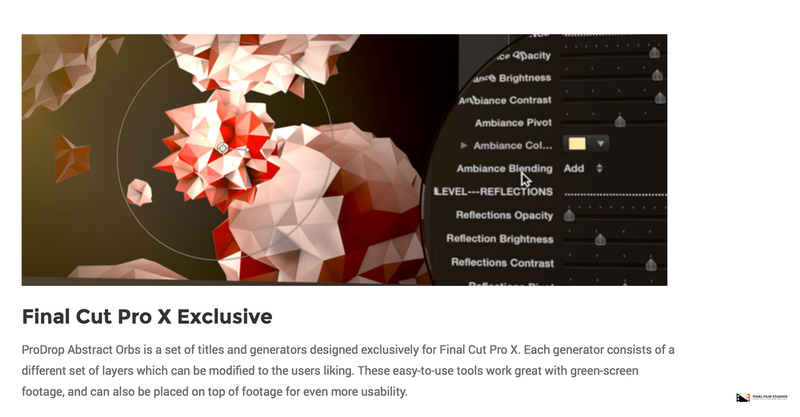 These easy-to-use tools work great with green-screen footage, and can also be placed on top of footage for even more usability.